Winterberg Road, Northcliff ext 19, Randburg, Johannesburg. KMS attorneys are a specialist Property Law and Conveyancing law firm, driven to provide superb service and develop long-lasting client relationships. We specialise in all property-related matters and understand that in today’s highly competitive market, quality insight and personal regard for each matter ensures a speedy and transparent transfer of title for both seller and purchaser alike. We offer excellence and efficiency as a service to you. 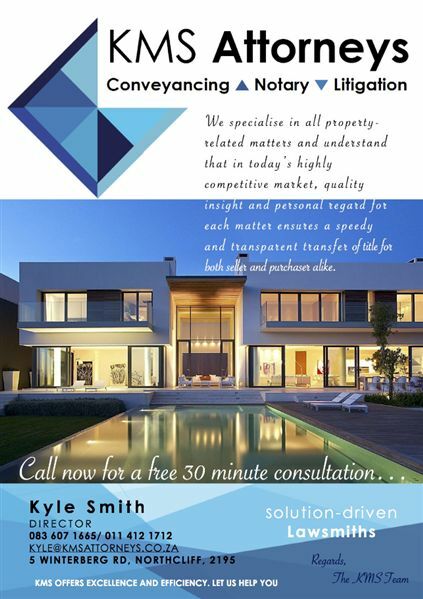 SO WHY CHOOSE KMS ATTORNEYS AS YOUR CONVEYANCING SPECIALIST? Client care and relations program: Daily consultations with agent, seller and purchaser, as well as extended assistance with bond finance, seller’s refunds from Municipalities, as well as disputes regarding suspensive conditions stipulated in OTP’s – assuring personal attention to detail of each transfer. Hire only the best legal and para-legal staff with over 20 year legal experience – competence is key! Highly competitive fee structure – we pride ourselves on avoiding excessive fees and also offer discounts in certain instances. We use rates consultants in both PTA and JHB Deeds Offices as well as In house consultant’s attending to issuing of clearance certificate , therefore effectively cutting costs and delays. Signature arrangement service – sellers and buyers are afforded the luxury of signing documentation at their homes or offices at no extra cost, thereby further eliminating delays and ensuring convenience and expedience. No deeds office rejections, thereby saving time and money (saving occupational rent etc). KMS, Let us help you.